The measurement masters came up with some good stuff, and I’ll discuss five high-level screw-ups people make when it comes to analyzing SEO metrics. The second excerpt comes from a 400 word entry that seriously talks about Meta Keywords and directory submissions as viable SEO tactics. But I digress. What the outdated and crappy definitions how SEO all have in common is they paint a verbal picture that high rankings are the goal of SEO. That is false. Get it? Traffic value. Traffic value is increased by more traffic and better traffic. Higher rankings are part of the path to the goal, but they are not the goal. I can outdraw a #1 ranked page in the SERPs if my page has a better click-thru rate. My page could add better value to my site from search engine traffic than your page does for you, even if your page draw more traffic for the same keywords – if my landing page converts better. The misguided paradigm of higher rankings being the ultimate SEO goal has let to some practitioners using rankings as a KPI for a full SEO campaign. Rankings should never be a KPI. Ever. Because a KPI tells you if you are achieving your goal. And rankings are not the goal. If you don’t focus on your real goal, you’ll have a deuce of a time meeting it. You should track rankings, but only as a metric that helps you understand if you’re maximizing visits for individual keywords. Rankings have too many limitations. It is impossible to rank track every keyword that matters. Rankings are hard to measure accurately. The impact of personalization of search results on rankings is hard to measure. Finally, rankings don’t tell you anything about the value being generated by SEO. You should not obsess over rankings. Visits are better than rankings. But they’re not everything. If the goal is to increase value, then traffic value = traffic quantity x traffic quality. Visit counts only tell you about quantity. And that’s only part of the equation. You absolutely must make an effort to measure quality. Any SEO that is focused on visit counts only is doing it wrong. So, traffic quality matters but so does how you define and measure quality. Bounce rate is one metric of many that help you understand visit quality. Unfortunately, many obsess over bounce rate as the ultimate quality metric, to their detriment. I could tell you why, but digital analytics guru (and partial muse for this article) Avinash Kaushik already explained why bounce rate obsession will get you fired. While you’re in there, you can see why rankings are a horrible KPI, if you didn’t believe me. This can be a tough question to answer, depending on your situation. For e-commerce site, you can simply look at revenue from the SEO traffic segment. (If your managing e-commerce and you don’t have revenue tracking integrated in Google Analytics or other analytics package, get it set up immediately. (Or find something else to do for a living.)) You can then try to understand the revenue an individual keyword brings in. For deep data magic, check into multi-channel attribution as well. For lead generation sites, measuring traffic quality get’s a little harder, but you should be valuating leads, measuring leads, and attributing them to SEO and the other traffic sources. This post might help. 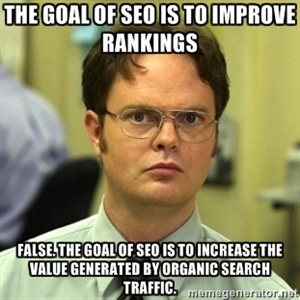 The point is to always try to determine ROI on SEO. Now when you’re looking at visits, leads, revenue, and goal completions attributed to SEO traffic you need to go beyond the default organic search segment found in Google Analytics. Otherwise, the folks responsible for the SEO campaign are going to take credit for a lot of traffic they shouldn’t take credit for – that’s branded traffic, i.e. search engine visits from when someone was already looking for your site. My comrade Andy has an awesome post on the ultimate SEO segment – non-branded organic search traffic. Make an effort to understand the value generated by this segment, and make sure its greater than the cost of creating this value and you’ll ensure your SEO efforts are a success. —-Well, that’s all for today. I think we’ll try to get deeper into more technical mistakes in another post. Speaking of which, want to help me write that? Tell me in the comments some big SEO measurement screw-ups you see, and if I use that mistake next time, I’ll give you a shout out.